The story behind the creation of this album has become legend amongst the contemporary indie crowd, but it's a great one, so for those few that haven't already heard it, I repeat it here. Fresh off of breakups with both his girlfriend and his struggling indie-roots band DeYarmond Edison, a despondent Justin Vernon retreated to a rural Wisconsin cabin to clear his head, chop wood, and figure out just what the hell to do with his life. His intention was to do absolutely nothing but think and heal, but not long after beginning his forced isolation, his muse struck, and it struck hard. Vernon soon found himself obsessively writing and recording on home equipment for up to twelve hours a day. 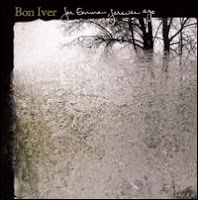 Three months later, he emerged from his cabin with these nine haunting demos, and after a brief stint in a North Carolina studio to add some additional instrumentation to a few tracks, the legend of Bon Iver was born. As for the album itself, it is near impossible to overstate how effectively Vernon captures the sense of isolation and self-reflection he was going through at the time. With the exception of the slightly more aggressive, embittered Skinny Love , his kiss off to his ex-girlfriend, you can almost hear the winter wind whistling through the snow-covered trees on these spare, desolate songs. It's an incredible mood album that's near impossible to resist...from the opening notes of Flume I find myself instantly transported into Vernon's emotional space...but it's not mood alone that make this album so effective. Vernon's voice is a revelation, a gorgeous, ghostly croon which has no clear antecedent in popular music. Not surprisingly, this has led to him since becoming THE guest vocalist of the moment. In 2010 alone he appears prominently on efforts by The National, Kayne West, and folkster Anais Mitchell, just to name a few. The other striking facet to For Emma is Vernon's fantastic sense of dynamics. This isn't your father's even-keeled James Taylor album. As spare as the album is, the songs of For Emma are a highly propulsive lot. Lump Sum soars on an overdubbed choir of angels, The Wolves (Act I & II) sputters through a troubling, idiosyncratic start to an explosive emotional conclusion, and the super intimate closer Re: Stacks seems to build a sense of heightened anticipation with each and every drawn out word. Simply put, For Emma, Forever Ago is the best release of 2008, and possibly the best singer/songwriter-styled release of the decade. I recommend it highly for everyone, but especially encourage older readers who are still wearing out the grooves on their 70s singer/songwriter albums to give this a try. If ever there was a recent album to pull you comfortably into contemporary times, this is it. Cherry Picker's Best Bets: Lump Sum , Skinny Love , The Wolves (Act I & II) , For Emma , Re: Stacks . Here's a fan video set to The Wolves (Act 1 & 2) . What is your opinion on For Emma, Forever Ago? Please feel free to post your thoughts.